Strobe: 1-25 times/second; Electronic shutter with strobe and pulse effects. Blue LED display for easy navigation with English language. Perfect for stage performances, DJ lighting show, Night Club, disco, evening or to set the mood, KTV,DJ,Party,Disco, Ballroom, Show, Par, Bar, Club, Concert, etc. 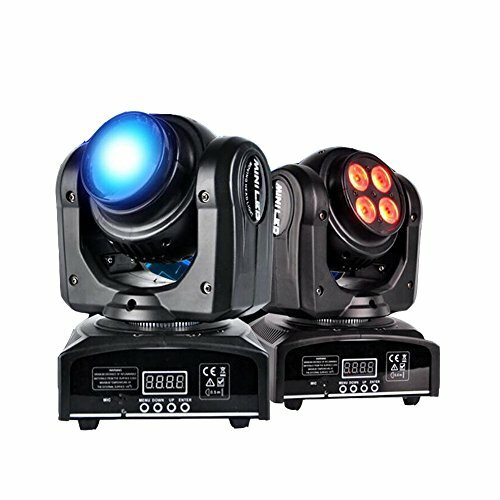 Unique design: double function with Moving Head Design, one side is 4 LED lights and other side is LED Spot Light, bring you brilliant colorful effect. 4 Control modes: DMX512, master/slave, sound control and automatic, DMX 512 connect signal controller, can pull up numerous kinds of color effect, stroboscopic effects with professional 15/21 Channel.. Mounting and adjustable bracket design: Easy to install and easy to adjust lighting angle and mounting to wall or ceiling. Light Source of 2 Side: 1 x 10W & 4 x 10W RGBW 4 in 1 LED,Perfect for Party, Home party, Halloween, Christmas, DJ, Disco, Wedding, Show, Concert, etc.